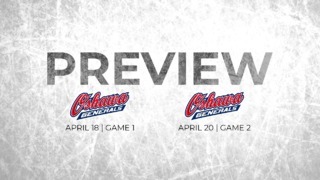 OTTAWA – In 50 days’ time, the puck will drop on the 50th anniversary season for the Ottawa 67’s Hockey Club – beginning a celebration of one of the most respected junior hockey franchises in Canada. On Wednesday, the 67’s unveiled their anniversary logo, plans for a legacy project and a series of signature games celebrating the past, present and future of the Barber Poles. The Barber Poles unveiled their 50th anniversary logo on Wednesday that will be featured on their jersey’s throughout their anniversary season in addition to new merchandise that will hit the shelves this fall. “It’s a modern take on a classic anniversary logo,” said Hunt. Throughout the season, the 67’s will pay tribute to each decade of their history from the Denis Potvin era to the prospects of today. The 50 years of hockey history will be commemorated through a legacy project inside The Arena at TD Place that will be unveiled over the course of the season paying tribute to Brian Kilrea and the past, present and future of 67’s hockey. The first element of this legacy project will be unveiled at the team’s September 24th home opener. With five games celebrating each decade of its history, the 67’s will also celebrate the first-ever game in their home arena, then the Ottawa Civic Centre (now TD Place), on December 29th and have a special game looking forward to the future at the annual Prospects Game on March 10th. Each commemorative game will pay tribute to the teams and players from that decade featuring appearances by 67’s alumni. These seven games will be featured in a special ticketing offer, ‘Celebration Pack,’ that include all signature games and a 50th anniversary t-shirt for as low as $99. 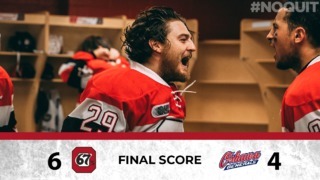 The Celebration Pack is on-sale now at Ottawa67s.com/Celebration-Ticket-Pack. The 2017-18 season will also include the regular fan-favourite theme games including the School Day Game (November 1), Family Day (February 19), Teddy Bear Toss (December 10) and Fan Appreciation Day (March 18). 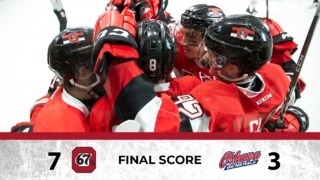 The 67’s will also renew their rivalry with the Gatineau Olympiques in regular season action, with the first of the two games against their QMJHL neighbours slated for TD Place on December 17. The 67’s open their 50th Anniversary Season on September 21 in Barrie, with their home opener set for Sunday, September 24 against the reigning OHL Champions, the Erie Otters. Season tickets for the 67’s 50th Anniversary Season are on sale now at Ottawa67s.com, by calling 613.232.6767 X1 Option 2, or in person at The Box Office at TD Place. Season Ticket Packages start as low as $325 – less than $10 per game. Single game tickets go on-sale September 5.